An aging Robert Taylor plays the eponymous Cattle King: Sam Brassfield, owner of the Teton Ranch in 1883 Wyoming Territory, presumably in Jackson Hole. Early scenes set up depredations on the range, with masked men cutting fences, stampeding cattle and shooting a Teton Ranch hand in the back. It turns out that Clay Matthews (a hefty Robert Middleton), another rancher based in Cheyenne is trying to foment a range war to clear the area so he can bring in cheap Texas cattle to flood the area. Opposing Brassfield are flinty sheepman Abe Clevenger (Malcolm Atterbury) and weak-willed Harry Travers (William Windom), whose sister Sharleen (Joan Caulfield) agrees to marry Brassfield in the course of the movie. Brassfield is supported by longtime foreman Ed Winters (Ray Teal) and Mexican cowboy/gunhand Johnny Quatro (a young Robert Loggia). 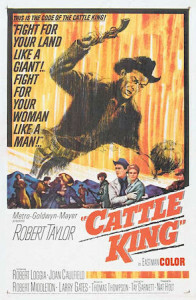 The Cattle King of the title, Sam Brassfield (Robert Taylor). The story is muddied by the passage of Pres. Chester Arthur (Larry Gates in lots of sidewhisker makeup and wig) through the state, from Cheyenne to Yellowstone Park. Whenever he shows up, everything gets ponderous. Eventually the Travers siblings are shot by Matthews’ gunman Vince Bodine (Richard Devon), and Sharleen is killed. It brings on a final unconvincing showdown between Brassfield and Matthews, who doesn’t look like he’s any hand with a gun to rival Brassfield. Clunky dialogue by writer Thomas Thompson (also an associate producer), arbitrary plot turns, too many unnecessary characters, relentless and unconvincing pacifism by Brassfield, meaningless presidential interludes, and little sense of Wyoming geography (Jackson Hole and Cheyenne are at opposite ends of a sizeable state) work against the film. The settings look more like California (which they are) than Wyoming and the Tetons. In color, at 90 minutes. 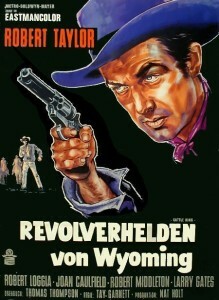 This doesn’t give Robert Taylor his best material to work with. For better Taylor westerns, see Ambush, Devil’s Doorway, Westward the Women and The Last Hunt, among others. 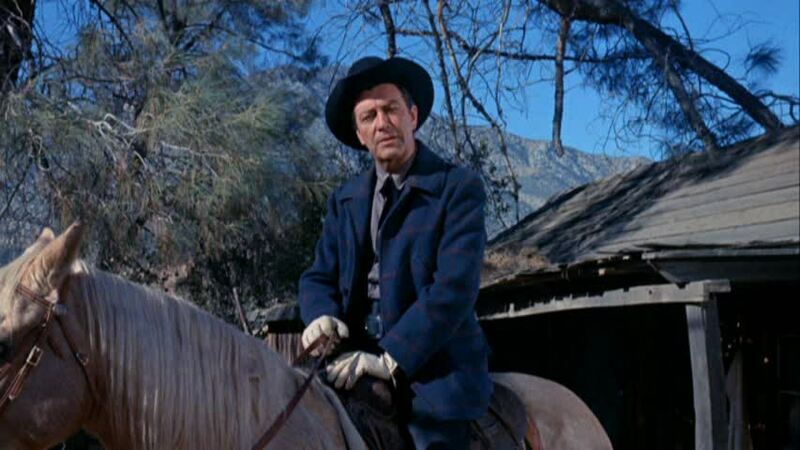 Robert Middleton was an exceptional character actor, sometimes a bad guy as he is here, but often benevolent or a character of mixed motivations. See him also in The Law and Jake Wade (again with Robert Taylor), Friendly Persuasion, and Big Hand for the Little Lady, among others. Robert Loggia is young-ish here; see him as aging outlaw Frank Jarrett in Bad Girls thirty years later. This entry was posted in More Westerns and tagged Range Wars, Robert Taylor on November 14, 2014 by Nicholas Chennault.